I recently updated our PE portfolio company holding period study to include 2018. 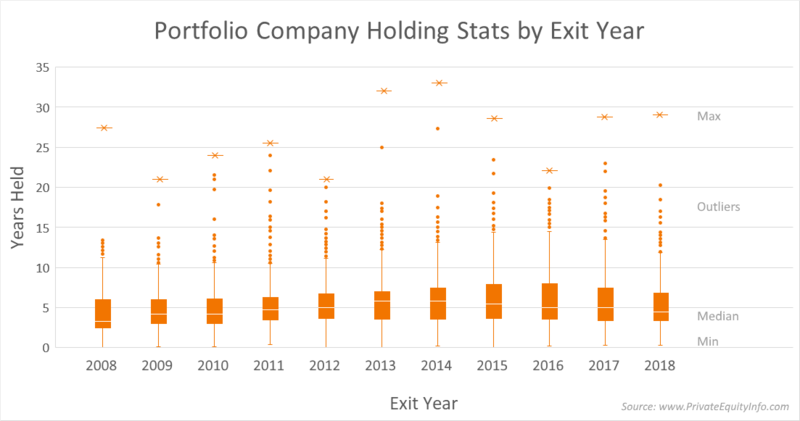 In this, I report the median holding period at exit. Today, I’m showing the quartile spread of that same data. Again in 2018, the minimum holding duration is very short – just a few months. In fact, there were a dozen portfolio investments that were held less than 12 months. As in previous years, the longest held position was a long time, 29 years. 29 years ago was 1989. This is the year I graduated high school. A lot of history has passed since then. Most of the longest held portfolio companies were held by European private equity firms. They tend to have a longer horizon compared to U.S. based PE firms.